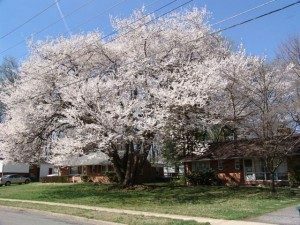 Trees growing too close to wires may benefit from plant growth regulators. DESCRIPTION: Growth regulators reduce vegetative growth, improving the root to crown ratio, and enhance the plant’s ability to photosynthesize under adverse conditions. In many species they stimulate fibrous root growth, giving the tree greater ability to mine the soil for water and nutrients. Growth regulators increase leaf thickness, chlorophyll content, and abscisic acids levels. Growth regulators help trees use water more efficiently. The responses listed above aid trees that are undergoing drought conditions. The health benefits are also necessary for construction damaged trees, declining and older trees, trees stressed from drought, trees growing in limited rooting area, and to counter injury caused by disease or insects. Research shows that growth regulators help trees become significantly tougher in response to some opportunistic insects and disease. They do this by thickening the protective barrier of the leaf and increasing the production of defense chemicals. Growth regulators are beneficial for trees that are too close to buildings, over head utility lines, patios, parking, walks, etc. The effects last approximately 2-3 years. The impact the first year is not as pronounced as the second and third years. Growth regulators are not right for every tree. The benefits can vary from species to species. A tree under stress must be properly diagnosed and an integrated approach is often necessary in the attempt to restore health.